A perfect addition to any home is a timber built conservatory. It can enhance your living space and become a real focal point of your home. We like to work with our clients to develop a unique space, which enhances your current living space as well as providing practical additional room. 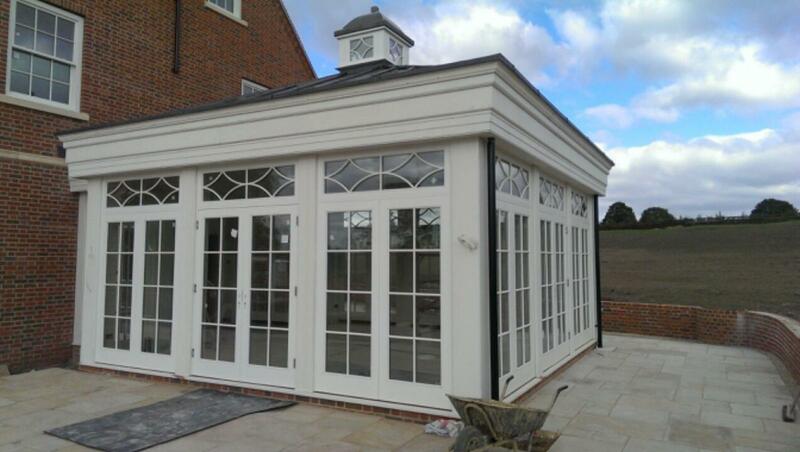 We have many conservatories as part of our portfolio to inspire you, or if you have an exact look in mind we can use our joinery expertise to work with you. All of conservatories are created from hardwood, and fully machined and finished in our purpose built Stokesley workshop. You can choose from a range of woods we prefer to work with as well offering you a choice of finishes to suit your location, the timber and your preferences. Paint and stain finishes are spray applied in the workshop to ensure quality and we can provide timber samples if required. Our conservatory ranges are finished of with a choice of ironmongery to suit the style as well as optional extras of skylight ventilations and guttering options. We supply and fit double glazed units if preferred and supply thermal efficient glass filled with argon gas to ensure maximum heat retention as well as great security. The whole process is under our control and your conservatory leaves our workshop fully factory finished, wrapped and ready for installation, built lovingly by our team of craftsmen. If you wish to enquire about prices for a conservatory, please do call us at the office on 01642 713339 and we will be delighted to talk through your ideas.